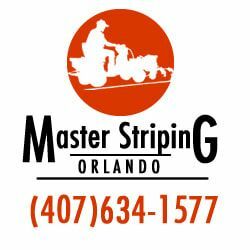 Parking Lot Striping Orlando is the best pavement marking company in in the entire state of Florida. We service the entire Greater Orlando area for all of your parking lot maintenance needs. We provide line striping services for both concrete and asphalt parking lot surfaces. We provide free bids on both new layouts, as well as restripes over your existing faded lines. We ensure that your parking lot is fully compliant with all city, state, and federal compliance codes laid out for parking lot owners, and your parking lot will pass striping compliance inspection. We use the best high quality striping paints on the market, and state-of-the-art striping equipment to ensure the highest quality striping job for your parking area. Our crews are highly skilled, knowledgeable, and trained in the art of striping, and bring many years of experience that can not be matched by others. Striping services we offer, but not limited to include: line striping, fire lane compliance, handicap stalls and ADA Compliance, crosshatching, loading zones, custom stenciling, speed bumps, wheel stops, bollards, metal signage, pressure washing and sealcoating. We are ready to give you a free quote today and look forward to servicing your parking lot with all maintenance requirements. Please contact us today. U. S. Pave has become one of the leading paving maintenance and installation companies in South Florida by providing unsurpassed quality, reliability and customer satisfaction.